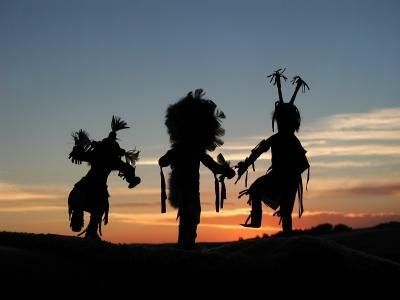 Hopi dance is rooted in millennia of tradition and spiritual beliefs. It is still an essential part of the Hopi culture today, performed both for the tribe members and rapt audiences. The full story behind the dances of the Hopi will probably never be known because they stretch back further than any definite (recorded) history. Most of the Hopi dance forms are oriented around the religious beliefs in the kachinas, spirits that live in the mountains and influence various parts of the everyday life of the tribe. The Hopi religion includes the belief that the Kachinas live in Hopi villages for six months out of the year and participate in the rituals and activities. In late July the time comes for them to leave, and the "Home" dance or "Niman Kachina" is performed for eight days. The Kachina spirits are represented by up to fifty dancers wearing brightly-colored costumes and elaborate large masks. They move to the rhythm of chants and drum accompaniment. The dance goes on for the entire day, both in movement and in short "clown" pantomimes which delight the audience. At the end of the Niman Kachina the spirits are thought to return to their home in the mountains until the following November. There are many other dances throughout the year, such as the Flute Dance, which has dancers representing a Boy, Maidens, and Priests moving through the village led by the "Kaleteka" warrior. There are also other dances such as the Butterfly Dance, the Buffalo Dance, and the Eagle Dance. Many dances include elements representing the most important element to the desert tribe: rain. In fact, the most famous Hopi Dance of all, the Snake Dance, is designed to ensure a fertile growing season for crops by bringing rain to the region. The performance that non-Hopi have called the "Snake Dance" is actually the final part of a much longer set of rituals performed over eight days by the men of the Hopi tribe. The dance itself has been the subject of artists and was performed for President Theodore Roosevelt in 1913 for the first time on camera. The ritual includes four days of gathering snakes from the desert, washing them and purifying them, and putting them into a specially-built "snake house", a pit covered by cottonwood branches. When the public part of the dance begins, Hopi priests will pass the snakes out to the dancers, who work in groups to distract the snakes from biting. The dance is very elaborate and dangerous, with the snakes carried in the dancers' mouths at times. Occasionally, the snakes do bite the dancers, but not very often, and it is very rare for a dancer to get hurt. After the movements and chants have been performed, the snakes are again released into the desert, the final part of a ritual designed to bring rain to the land to nourish a bountiful harvest. While this last part of the snake dance has been open to the public in the past, in 2009 the Mishongnovi Hopi banned any "non-American Indians" from watching the ritual. Disrespect for the dance and illegal photography were cited as the reasons behind the decision. It is unfortunate that this was necessary because many people have been very impressed and inspired by the dance. In Roosevelt's extensive journal about the performance he saw, he wrote that it was important "to preserve and develop the very real element of native culture." Whether open to the public or as part of their own tribal rituals, Hopi dance forms continue to be an integral part of the culture of the Americas. Thanks to the work of historians and exhibits such as the Hopi Agricultural Expo, everyone can deepen their understanding of native American peoples and their traditional dances.